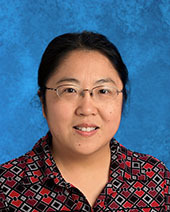 In 2010 and 2015, Carol was honored with the “Outstanding Achievement in Teaching Chinese Language and Culture” by the Chinese Association of Greater Toledo. Tianhui lives in Sylvania with her husband, Guofa, and two children, Tony and David. Tianhui enjoys art, gardening, reading, and spending time with her family. Carol can be reached at cyuan@meadowmontessori.org.